Technology Support Services, responsible for the management of the college’s computer and technology resources. 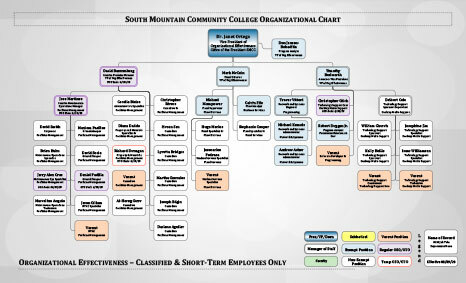 College Business Services, responsible for the college’s financial operations, cashiering, purchasing, property, assets, capital inventory, and budget oversight, third-party vendors such as the bookstore, copy center, and food services. Facilities Services, responsible for oversight and development of new facilities on campus, as well as maintenance and use of existing buildings. College Public Safety, responsible for the health, safety, and compliance of our college community. This office also reports directly to the Maricopa Community College District.